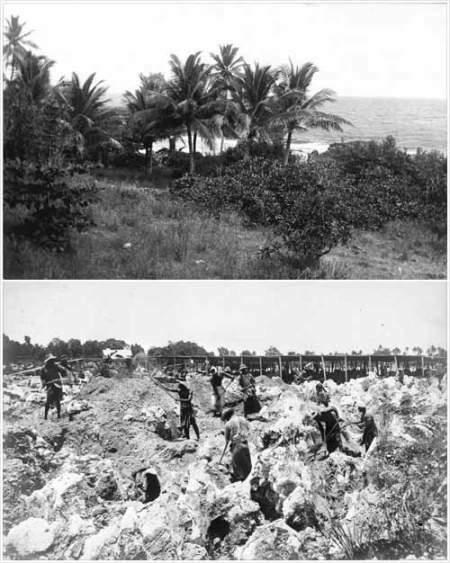 From 1900 to 1980 the Australian, New Zealand and British phosphate companies mined the island of Banaba in the Republic of Kiribati for phosphate. As a result, the island was rendered uninhabitable and the Banabans were relocated to the island of Rabi in Fiji. Yuki Kihara (Samoa/NZ) and Katerina Teaiwa (Banaba/FJ/AUS) will bring together historical archives and new work that will shed light on this history and its ongoing impact on Banaban communities. Katerina Martina Teaiwa is Pacific studies convener and Head of the Department of Gender, Media and Cultural Studies in the School of Culture, History, and Language at the Australian National University (ANU). Her book entitled ‘Consuming Ocean Island; Stories of the People and Phosphate from Banaba’ was published by Indiana University Press in 2015. Born and raised in the Fiji islands, she is of Banaban, I-Kiribati, and African American heritage. Image: ‘Banaba before and after mining’ Photographs by Lilian Arundel. Courtesy of Alexander Turnbull Library, Wellington New Zealand.